A great way to use Spring asparagus and get tons of protein. This is last years recipe I thought needed some love this year. Enjoy! Happy Spring my friends, it’s sixty degrees here today. Bring the new season in with fresh, easy, healthy, seasonal veggies! I am a fan of quinoa. I have always been a fan of grains and things of the grainy nature. I love brown rice, barley, and quinoa! I also like the word, and how versatile of food it is. Not to mention it is the only complete protein of its kind out in the world, and it has been around for a long time, like ancient people ate it. And they kind of knew stuff about stuff, so I am a fan of that. Like chocolate, ya, they knew about that, and look where chocolate is now folks. So if they liked it, it is most likely good for us, and we should eat it. I eat it cold, hot, for lunch, dinner, breakfast, and with all sorts of things in it. You can make it as light or hearty as you want, that part is up to you. So lets see what I came up with today! 1. In medium pot place the quinoa and stock/water, and 1 tsp of salt, stir to combine. Bring to a boil, then reduce to a simmer. Cover and cook for 15 minutes, turn off heat, and let stand for 5 minutes. Taste to see if it needs more salt. If so, adjust seasoning by adding more salt now. 2. While your quinoa is cooking get a separate saute pan add 1 tsp of olive oil over medium heat. Once the pan is warm, add the asparagus, sprinkle with a pinch of salt and pepper. Toss to coat with the olive oil. Cook for 1o-15 minutes or until al dente, stirring occasionally. 3. Add the figs, lemon zest, lemon juice, 1 tsp pepper, and 2 tsp olive oil to the quinoa and fluff it up with a fork. 4. 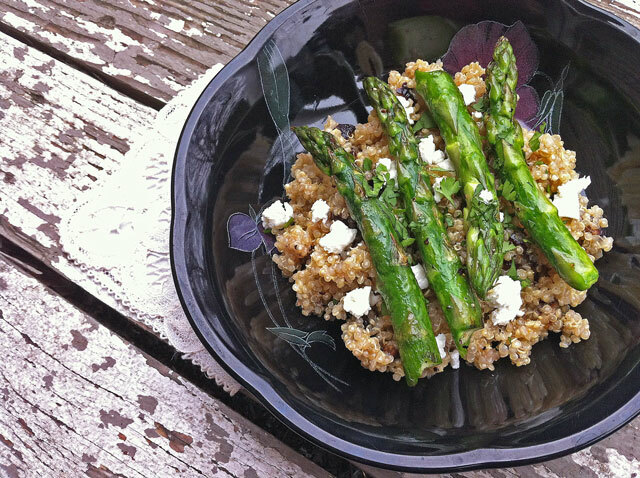 Serve the quinoa with sprinkles of goat cheese, cilantro or parsley, and top off with the asparagus. This looks amazing! I LOVE the idea of figs with the asparagus, and goat cheese. I bet it was delicious! Can’t wait to try that flavor combo! Hooray, spring! 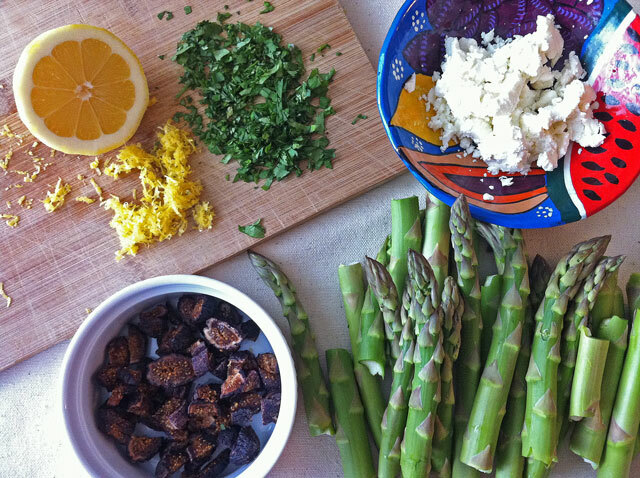 This is exactly the kind of meal I want to make out of the new season asparagus popping up at the farmer’s market. Thanks for the great idea! I am so happy to get our spring veggies! I hope you like this, it was quite tasty.